I absolutely loved this book. The friends to lovers theme was really well done. Gray stole a piece of my heart and Knox gave me someone to aspire to be like. The character development was really well done, and made it so easy to connect to both Gray and Knox. Gray has loved Knox all of his life, but he couldn’t be with her because she was with his best friend. When life unexpectedly brings them back together, he hopes this is his chance to get the girl. Knox was known and the ‘Junkyard Dog’ and I absolutely loved this book. The friends to lovers theme was really well done. Gray stole a piece of my heart and Knox gave me someone to aspire to be like. The character development was really well done, and made it so easy to connect to both Gray and Knox. Gray has loved Knox all of his life, but he couldn’t be with her because she was with his best friend. When life unexpectedly brings them back together, he hopes this is his chance to get the girl. Knox was known and the ‘Junkyard Dog’ and never believed someone like Gray could love her. Will they make it work and finally be together, or will life continue to get in their way? I really enjoyed reading the entire book. From the get go I connected with the characters and enjoyed following the story line. Erika has a really refreshing and vivid way of describing the scenes. The only think I found a bit lacking was the ending? The last chapter leaves us in the midst of the "crisis" or "climax" and all of a sudden we are in the Epilogue where they are walking down the isle and getting married?? We never get to be part of the Falling Action or Resolution part of the plot li I really enjoyed reading the entire book. From the get go I connected with the characters and enjoyed following the story line. The only think I found a bit lacking was the ending? The last chapter leaves us in the midst of the "crisis" or "climax" and all of a sudden we are in the Epilogue where they are walking down the isle and getting married?? We never get to be part of the Falling Action or Resolution part of the plot line. It's like we are missing a few steps there to bring the story back around. But all in all, a good read. I loved the previous two books in the series and this was no exception. Gray and Knox’s friends to lovers story was everything I’d hoped for and more. 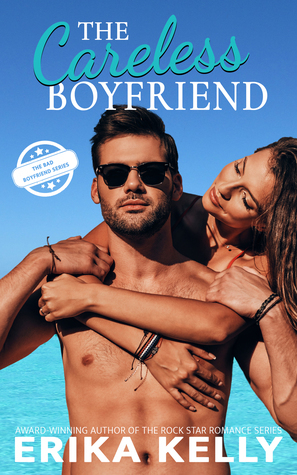 The Careless Boyfriend is a beautifully written second chance romance. This is romantic comedy at its finest. Erika Kelly is definitely one of my go-to authors when I want a well written contemporary romance with a hero that will make me swoon. I was immediately hooked in from the opening pages in this heartfelt story. I was completely invested in e I loved the previous two books in the series and this was no exception. Gray and Knox’s friends to lovers story was everything I’d hoped for and more. I was immediately hooked in from the opening pages in this heartfelt story. I was completely invested in every page until the very end. The storyline is so well-crafted, well–paced and a variety of interesting and intelligent characters kept it captivating throughout. I really enjoyed this book. At times it was a bit predictable but some points had twists I was not expecting. I did notice some spelling errors which was a bit annoying. The end was sweet and cute and made me feel all the fuzzies. It was well written and would read more from this author! This review has been hidden because it contains spoilers. To view it, click here. I loved this book, my first one by this author. Lots of emotion and action. I was stressed out for Knox!☺ Great characters. I can't wait to read the other books in this series. I received this book in exchange for an honest review.